It’s true; crash diets are not sustainable, and adopting a healthy lifestyle is the best way to look and feel your best year round. But there are times when you really want to look like a rock star for pictures: your 30th birthday, your wedding, and festival season. One month left before Coachella, and every festival goer is probably working overtime to get their bodies “picture perfect.” I’m not great at following particular restrictions for an extended period of time, so I save any crazy rules for 3-4 weeks prior to my moment of glory. This year I’m starting with a day of juice to jumpstart and reset. Curious to see how a carnivore like me fares on a liquid diet? Read on for my first successful experience on a juice cleanse… and the lessons I learned for the next one. I’m a craver… boba, pizza from Fresh Brothers, a caprese sandwich from Bay Cities, kale salad from Tender Greens. I like to indulge, so when I signed up for a juice cleanse I knew the challenge that was in store for me. 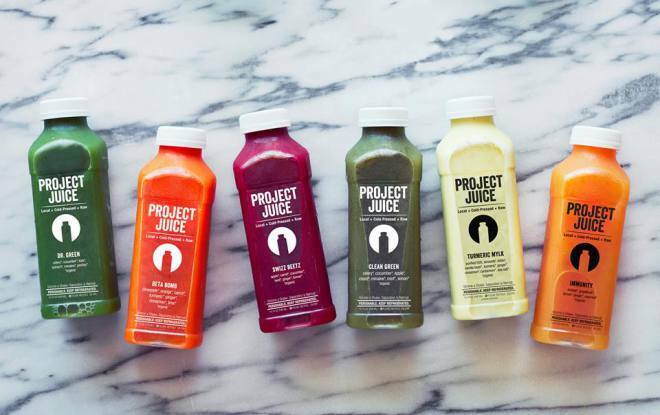 I actually tried a 3-day juice cleanse when they first started popping up in L.A. some years ago but failed on Day 2 when I decided to have a hot dog at Abbot Kinney’s First Fridays. C’est la vie. This time around, only committing to 1 day seemed much less daunting. Having learned from Project Juice that a successful cleanse begins with prep—slowly cutting out meat and only eating raw food the day before, I did my best to ease my intake a couple days before. I could’ve been better about it had I read their guide online, but 24 hours prior I ate a ThinkThin bar, grilled chicken and kale from Tender Greens, almonds, and a Trader Joe’s salad though I did impulsively splurge on sugar at lunch. Despite that little slip, I went to bed early to mentally prepare. I parked in the lot under Crocker Galleria. As soon as I gave the guy at Project Juice my name, he had a thermal bag all ready to go. Valet parking, riding the elevator, picking up the cleanse, and getting back to my car happened in under 10 minutes. This was pretty easy to drink and a good way to start the cleanse. I later learned I’m not a fan of lemon in greens juices. I don’t like beets. The ingredients in this one mask the taste of it for the most part, but the after-taste is very distinctly beets. I was grateful for the seemingly thicker consistency of this one because what came after it was likely the biggest challenge of the day. It might be because I’m craving a cheeseburger now, but this is DELICIOUS! I caved and had a bite of kale salad. I’m still working on #3… The cayenne is becoming a bit much on the empty stomach. Is it Almond Mylk time yet? Not quite done with my Master yet, but I need a change of pace and taste so I’m going to finish #3 by starting #4. I had a cube of watermelon. Don’t shoot! Not hungry but just WANT food… a cheeseburger to be exact. Love the EZ Greens! No lemon (which I think was giving me too much of a kick for my taste this morning), add cucumber. Recipe for success, I think. Ah, tea… So refreshing! The perfect little break from all the juice. I should’ve had this after the Master. H20. Who cares if my stomach is growling a little. My family is eating a variety of delicious food in front of me. I swear the smell of each individual dish has never been so apparent and enticing. I have a bite of a chicken ball before stepping back and retrieving my last juice of the day. This surprisingly curbed any cravings I thought I had. I realize now that anything I thought I wanted was purely a want and not a hunger need. I had the revelation that despite my cravings, I really don’t need to eat an entire pizza to myself. A small portion would be enough. Ah, the sweet taste of success! I swear people do cleanses so they can have that rewarding almond milk at the end. After my revelation with the D-Tox, the almond milk was satisfying enough to end the day with. Unless you live or work by Crocker Galleria*, it’s not worth the trek during rush hour to park and pick up your cleanse. I saved $12 (delivery is $15 but parking was $3) and it did take less than 5 minutes to park and pick up, but the traffic getting there was pretty bad. Plus, you can start drinking juice earlier and probably have your tea at a more appropriate time (i.e. 4pm). *Project Juice has 2 other shops and 2 other locations that serve their juice. Be in a laid-back environment. Definitely do it on a day when you don’t have to move much and are in close proximity to a restroom. Being at home or at a desk will also keep you on schedule. It also helps to be around less people; food temptations just seem to be more available when you can’t have it. You don’t have to be by a refrigerator. They suggest you refrigerate within 2 hours of getting your juice, but I brought ice packs that actually kept the juices cold all day. You can skip the coffee! Start the day with a cup of green tea. This is the first day in a while I didn’t have a cup of coffee, and I am surprised at how awake I felt all day. I will give some credit to my more regular (read: early) sleep schedule this week, but had I been more prepared I would’ve had green tea in the morning. I really appreciated the Cheat Sheet that came with my cleanse. It outlined great tips and how I should go about my day. I’m a sucker for any kind of educational reading to go with my purchases, and I only wish I’d read up online about how to prep. The more you know, the more smoothly your day will go. I probably haven’t had as much water as recommended. It’s tough drinking so much liquid but if you swap in water bottles after every 2 juices you should be good! Even though they’re liquid, juices dehydrate you… so you have to remember to keep balancing. Tell the people you’ll encounter that day. Do get your support system involved. My mom knew I was doing the cleanse, and while she normally presents me with a minimum of 2 entree options for dinner she wouldn’t let me eat anything to break the cleanse. My coworkers also checked in on me as they saw me. It’s helpful to have people keep you accountable. I, craver of cravers, (aside from the 4 bites of solid food) successfully completed a 1-day juice cleanse. My stomach isn’t really growling, and I will go to bed without sneaking Porto’s cheese rolls that my sister just brought home from L.A. I can say with certainty that I will not become a vegetarian and I think greens juices are better suited as a supplement to your diet, but this may not be my last cleanse. The included guide suggested instead of chugging the juices that I “chew” them. As a habitually slow eater, drinking my juices at a slower pace still did not feel like I was chewing. I wasn’t savoring the taste the way I normally do with food, but despite that fact my body felt pretty content throughout the day. My mind was another story, continually coming up with something that I couldn’t wait to eat the next day. As I mentioned, it finally clicked with the last juice when I chose to drink it rather than cave to the tempting food around me. I won’t stop eating any of the foods I crave, but I will be even more conscious about how much my body needs rather than how much my mind wants. Have you done a juice cleanse before? What have you taken away from your experience? *I did this cleanse gratis last fall through Project Juice.